It appears like an illusion to you! So were we thinking that is some concept chopper that is waiting to see the daylight, but damn we were wrong! This mighty looking two wheels beast is engineering miracle! Just look how gorgeous it looks, ready for Nicolas Cage to ride it in the next part of Ghostrider! Yeah this is the kind of chopper that will leave behind him fire lines and can cruise the area in few seconds, Hubless Monster built by Amen Motorcycles. 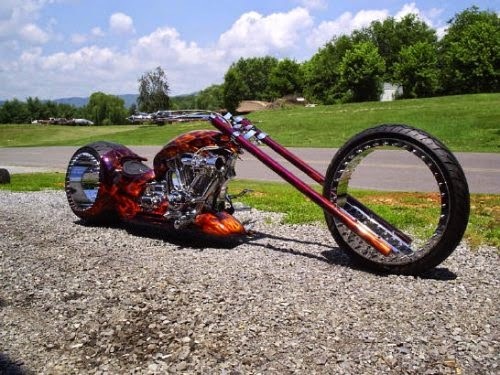 So ladies and gentleman we introduce you the monster chopper that rides without “rims”. Yeah there is a circle that holds the tire but there is no center where is the axle attached! But honestly that’s not the most impressive about this beast, the most interesting fact is that he is in full riding shape ready to answer all possible challenges and provide the rider with excellent pleasure. But what is the pleasure if it is riding like ordinary chopper what’s the big deal here? 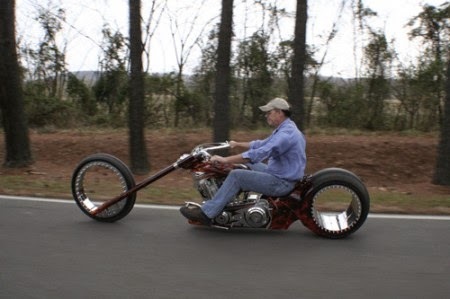 Now take a look at the video and see the chopper in action, riding without rims.